HAPPY MEMORIAL DAY! In SYNCHRONICITY with Sun/AHAU, this is a Day when we Honor those who Valiantly Offered Themselves in Service for the Greater Good of the Whole. May we Acknowledge with Gratitude All our Ancestors who walked a path of Divine Agency as our Outlook and Protector. We arrive at Tone 12’s intention of Understanding with the Illumination of Sun/AHAU. Completing the 11th uinal of Resolution, we’ve received all the “clues” we need to bring clarity to a new Truth. Tone 12 is the day when a Truth sinks in that can raise us to a new and functioning whole. Sun brings the Light of Illumination to something we haven’t seen before. We are given the Brightest Light by Sun/AHAU who calls us to open our eyes to the Truth. Sun not only illuminates that which is the shadows, but also helps us see what is hidden in plain sight. Sun is the Expert of Higher Guidance. Sun/AHAU is a symbol of the Divine Masculine, the Hero that encourages us to live up to our own potential. Whatever Truth may unfold, we are guided to look beyond our initial understanding to see its potential to transform our experience of every future journey. Ahau is the Day Sign of the Ancient Ones, those Humans that accomplished the Highest Levels of Divine Consciousness. They are the role models of what we could aspire to be, living as the Masters of their own Consciousness. They arrived at the Full Understanding of their Two Sources of Consciousness, and found the Way to Live in the Truth of their Higher Self. On 12 Sun/AHAU they share their Divine Wisdom so that we can be Transformed by this New Truth. Humans draw wisdom from experience. It’s in our Human Nature to question a new understanding. We have to experience the Truth to accept it as our own Wisdom. The only substitute for personal experience is learning by example. We are capable to establish Truth through a demonstration by someone else. The archetypes seen throughout Ancient History are a demonstration of a way of being that couldn’t be easily conveyed by words. They helped Human understand new Truth through an example of a constructed personality. I’m inclined to disagree with the theory offered on “Ancient Aliens” (TV Show) that the carved images of Humans with the head of a bird are the evidence of surgical experimentation. Instead, I suspect they are imaginary constructs that illustrated aspects of Divine Nature. Illustration is a way of understanding that Human is drawn to. 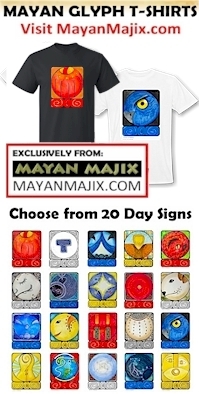 “A picture is worth a thousand words.” The Mayan glyphs are among many illustrative languages from the Ancient world, which convey wisdom via visual symbols and archetypes. These are all among the unlimited possibilities of our Higher Self. We were made in the image of the Creator. AHAU offers an illustration of Human’s Divine Destiny. This is the illustration of what Human was created to become, when we are surrendered through an Offering of Atonement. Sun/AHAU is an Archetype of our Higher Self and our own Divine Nature. The Cherokee Day Sign, Flower/Gun’sti, is the face of the Flower that follows the movements of the Sun. As Humans, we are led on a course to our Divine Identity by following the movements of a Divine Creator. As the Greatest Truth that Human could know, we were given the Natural World that reflects our own Truth. With each Dawning, Sun offers a demonstration of our own Divine Identity as Bringers of Life, Inspiration, and Happiness. Human is a dynamic creation given a lifetime to grow to maturity. Human is “the bearer of time.” The Road to our Destiny is accomplished one day at a time, one new truth at a time. The Song Sparrows are back this morning. The “big baby” is still crying to be fed, though it is making strides in feeding itself today. It seems to prefer the suet to the seeds that are easily accessible. To get to the suet, it has to take the risk of grabbing hold of a moving object. Its latest progress is in finding a place beneath the hanging suet cage for the leftover crumbs. It’s constant crying reminds me of how I’ve seen myself go “kicking and screaming,” as I’m drawn forward to my own liberation. Our suffering will be over when we experience the Truth that We Are Capable to reach the Reward. I added a little Divine Help, securing the cage for more stability. 🙂 I can hardly believe that I’m watching a bird being taught how to feed itself. It’s a good excuse not to tackle the outside cleanup from the winter, and to enjoy the beauty of Mother Earth right outside my window. Balcony Training Ground; suet cage hanging on side of corner plant. The Blessing is that the balcony is SMALL, so these events are happening just a few feet away. Our Higher Self measures beauty by different standards. Our Higher Self sees the Evidence of Miracles by a Divine Perspective. We weren’t meant to take the Wisdom of the Ancients as our final word. These are only the crumbs that were left behind to lead us to our Own Illumination. We are capable of more than the Ascended Masters. By their example we hold all the potential to reach New Horizons of Consciousness. Our Illumination is a collective undertaking. Each generation can begin from Higher Ground as One in the Whole of the Transformation of Humanity to the Consciousness of our own Shared Divinity with the Creator. 12 Sun/AHAU shines a light on who we are. When ever we meet the Sun, we can expect a Revelation. We can see something that was hidden, yet in front of us all along. As Awakening Beings we are only beginning to see the Light. In the Uinal of Resolution, Sun/AHAU shines a light so we might clearly see the clues of a Divine Mystery. To all my relations, may we be inspired by Sun/AHAU to envision our Highest Aspirations so we might “set the mark” of a new Understanding. May we see that the Ego’s illusion of imminent failure, is subservient to the Vision of Unlimited Possibility that can be seen by the Higher Self. May we not characterize ourselves by our lower thoughts, but see them only as stones we would clear from a path. We have the power to transform our obstacles into milestones of progress. May we hold a Vision of the Divine and invest a 110% effort, to accomplish something that has never been done before that would be a Blessing to the Whole of Humanity. “12 Sun/AHAU shines a light on who we are. When ever we meet the Sun, we can expect a Revelation. We can see something that was hidden, yet in front of us all along. As Awakening Beings we are only beginning to see the Light. In the Uinal of Resolution, Sun/AHAU shines a light so we might clearly see the clues of a Divine Mystery.”…one small step at a time! AHO and bingo, at least for now – until the next truth needs understanding. my friend says that love is the way, the connection to and with the Divine, the vibe train to get on, if you want to find the truth of Self. We are all One, we are all related, en lak’ech. sun keep on shining!